One of the first applications for Photodigm’s single frequency, diffraction limited DBR lasers was second harmonic generation (SHG) for an RGB laser projection module. This was in the days around 2004 when the big box consumer electronics showrooms were filled with large rear projection televisions. Laser projection was seen as a way to compete against the svelte but expensive flat panel models. The low etendue of the diffraction limited laser beam would compress the optical path, and the semiconductor scalability of laser diodes offered an economic competitor to the short-lived high intensity discharge lamps that illuminated most of the volume on the showroom floor. After all, the lamp was the costliest and least reliable element of the BOM in those sets of the early 2000’s. At that time we were challenged by one of our customers to develop a green laser that would meet the demands of a consumer product – manufacturable, scalable, efficient. During the course of this work, we spent a great deal of time and effort to understand how best to achieve frequency conversion at high modulation rates and maximum efficiencies. The conventional frequency doubled YAG laser lost on both counts. Photodigm’s high power DBR lasers proved ideal for this task, and we demonstrated highly efficient conversion of 1064 nm photons to green photons using single pass doubling in a periodically poled lithium niobate crystal. Multiple competitors had SHG offerings. All were pitched as the ideal solution for laser projection. They all came down to three options: (1) single pass through a waveguide crystal (“waveguide”), (2) multi-pass in a resonant cavity (“multi-pass”), and (3) single pass in bulk crystal (“single pass”). Each offering utilized the same physics – phase coherent, fundamental mode laser beam of narrow bandwidth capable of generating the intensity in a non-linear crystal to effect second harmonic generation. We posed the question – What determines the most efficient technology to use for the application? The next question quickly followed – How do you present the options visually and in a manner that is readily understood? Once the question of efficiency could be answered and the options presented clearly, then engineering decisions could rationally be made that would lead to a practical solution. The conversion of infrared light to visible light by second harmonic generation requires the propagation of a high intensity of phase coherent light within a non-linear crystal. Independent of doubling technology, at low power densities in the crystal, a doubling of the fundamental power results in a quadrupling of the second harmonic power (slope of 2 on a log-log plot.) At 50% conversion, saturation is reached, and the slope becomes 1. Achieving the highest efficiency would require operating near saturation. As we plotted this behavior on a log-log graph, several points became clear. 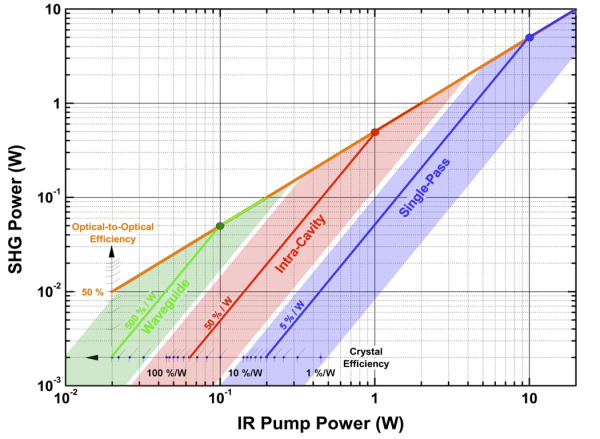 To achieve saturation with a 100 mW DBR laser would require a crystal with a 500%/W efficiency, only possible with a waveguide crystal. Lower crystal efficiencies required higher powers in the crystals, best achieved with a multi-pass design to produce a high standing wave power in the cavity. Single pass became attractive again at power levels above several watts, where bulk crystals with efficiencies on the order of 5%/watt could achieve 50% conversion. The Photodigm Technology Selection Chart evolved from this analysis. Reproduced below, it shows the three primary methods and operating regimes for optimum second harmonic generation in non-linear crystals. At low powers, below 100 mW, a waveguide is used to confine the beam. At intermediate powers, the most efficient method is through a resonant cavity (multipass configuration). At higher powers, the fundamental power is sufficient to be doubled through only a single pass. To generate >2 watts of frequency doubled power, the most efficient solution is single pass through bulk PPLN with a conversion efficiency of < 10%/watt. As we were developing this technology, however, progress was being made on multiple fronts. Huge investments made by Samsung, LG, and others disrupted the large screen TV market and flat panels completely displaced rear projection by 2008. Interest in projection displays shifted to the low power picoprojector, but by 2009, tablets and high resolution smart phones captured the public’s imagination. Picoprojectors faded to the relative obscurity of niche markets. However, as a result of this excursion into laser projection, Photodigm developed a complete line of instrument quality for atom optics, non-linear optics, and spectroscopy at key wavelengths between 739 and 1083 nm. Please contact us for more information.